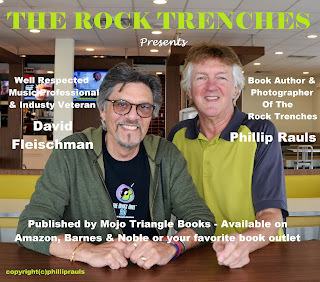 Pictured here on a mini-book tour is well-respected music industry professional David "Flash" Fleischman and book author of The Rock Trenches Phillip Rauls. The new book is trending well while giving readers a peek behind the curtains of the mysterious antics and shenanigans of those in music industry. Published by Mojo Triangle Books and available at Amazon, Barnes & Noble or your favorite book outlet.